Let’s Hail . . . a Rickshaw? 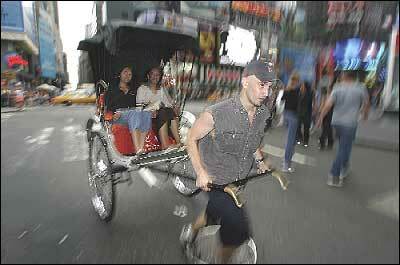 Iftekaruddin’s rickshaw is one of five now deployed around Times Square and Central Park by Shanghai Rickshaw. They should not be confused with the pedicab, of which there are around 250 in the city, according to Frank Luo, Shanghai’s co-owner. Pedicabs and rickshaws are virtually unregulated, so it’s hard to know for sure.